The Lantic Premium Entertainment System is an IP based Audio/Visual Entertainment solution with central Media Storage Server(s), SD or HD Video Streamer(s) and up to thirthy Entertainment Center Clients. Movies and music are centrally stored on one or more media storage servers and are distributed to the entertainment centers via a single CAT-5/6 cable Ethernet network. Analogue audio and video signals like satellite TV and camera signals (optional) are captured in a streamer and distributed via an Ethernet Network. All media content is available on-demand from the entertainment centers. The Lantic System is fully IP based, user-friendly, reliable and comes with an easy to use central Media Administration module accessible from a central PC. The single CAT-5 or CAT-6 cable run between the Lantic Central Servers and the Lantic Clients makes installation or retrofitting relatively straight forward. Provided the on-board Lantic LAN is connected to VSAT or 3/4G, full remote Lantic system support can be provided by Lambda Marine for any diagnostics, system tuning and/or maintenance. A Cabin Control System which is the key to on-board comfort, quick, subtle and simple to use. Via the remote control you can control all type of lights, air-conditioning, curtains, blinds and other equipment. The latest Lantic Central A/V Server uses a combination of separate SD Streamer Servers (12 SD Streams each) or HD Streamer Servers (4 HD Streams each) and Content Storage Servers (6TB standard, optional 20TB, RAID5), to stream AV content to the Lantic Entertainment Centers’ located in each cabin. The Lantic HDD Streamer Server streams 4 HD streams (Blu-ray and/or HD Sat-TV) per Server. Additional HD Streams can be implemented by adding HDD Streamer Servers. Lantic’s HDD Streamer is both exceptionally compact and energy efficient, making it easier to install and far more effective in its use of space than alternatives. The Lantic HD streamer comes equipped with four HDMI input ports and the capability to encode up to 1080p HD video. Each HD streamer can control 4 sat receivers via IR. This enables it to stream up to four simultaneous H.264 audio/video signals in a multicast format on Ethernet via a managed switch. The Lantic CSS Streamer streams 12 SD streams per Server. The streamer captures analogue, stereo audio and composite or s-video signals and converts them into digital streams which are streamed on the Ethernet network. Terrestrial radio (optional) and TV tuner can be implemented. A maximum of 12 audio/video, terrestrial radio or TV sources can be streamed per central stream server. 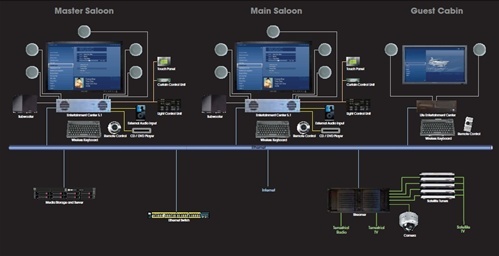 Multiple central stream servers can be used. A priority pool for satellite decoders can be configured and various types of satellite decoders can be implemented. Multiple Content Servers can be installed optionally to increase storage capacity even further. The Lantic A/V System can be supplied with three different types of Lantic Entertainment Centers, the Lantic MEC, PEC or SEC, described in detail hereafter. These clients feature full functionality in a small form factor and with a high temperature specification; up to 40°C. Lantic’s compact, state-of-the-art Modular Entertainment Centers (MEC) form the core of the audio-visual system in each individual zone. Installed out of sight, they receive commands from the remote controls that select and control the entertainment system components such as the central media server, satellite TV tuners, terrestrial feeds, Internet and other sources, and transmit them to the amplifiers, speakers and monitors. They also act as the relay point for external inputs such as disc drives, iPod drives and games consoles, and receive, process and transmit commands for the cabin control features, CCTV and other hotel functions. Each MEC has an integrated 2 x 10w amp and Dolby Surround 5.1 and 7.1 outputs and can be used with external amplifiers. The standard 10W output can be used as a slave unit in sub-zones such as bathrooms, but elsewhere the owner is free to specify external amplifiers of their choice for interfacing with the MEC. It is controlled via the well-know and unique Lantic RC1 Remote Control unit, using Z-wave. The Lantic Panel Entertainment Centre is a 21.5-inch touch-panel HD screen with built-in processor that comes preloaded with all the necessary software to link straight into the central Lantic media servers. By removing the need to install a Modular Entertainment Centre (see above) the screens are ideal for crew quarters and other areas where space is restricted. As well as having full access to the central music, movie and satellite services, six USB ports enable the connection of a selection of smart devices, external DVD and hard drives, and an HDMI input accepts Blu-ray players and hi-def games consoles. External speakers can be linked for a full audio experience and the entire system can be operated using any of the Lantic remote control options. It has the same features as the MEC; Audio on Demand, Video on Demand (SD & HD), Central sources playback from Sat TV/Terrestrial TV/FM radio/Cameras, Internet Access, Email Access (Read and write), a Power Save function and LAN connection. It also has the same options as the MEC; external Blu-ray Drive, Lantic Cabin Control, CCTV monitoring, Navigation Systems Monitoring, Service call and iPod docking playback, except Monitor lift control. It features a virtual on-screen keyboard when used with the Lantic RC20 Remote Control App. The SEC (Small Entertainment Centre) is an audio-only player. The SEC is intended for the areas/zones that are not equipped with a monitor/TV screen and only require audio features like Music. It features Audio on Demand (Select music from a media server or playback of a public playlist), Radio (Select FM radio channels, if connected via CSS) and Service call (Service call via Lantic remote control, routed to crew areas). It is controlled from the Lantic RC20, which is a Remote control application for iPod, iPhone and iPad. It has a LAN connection and can be connected to an external Audio Amplifier. Lantic offers several options to control each MEC, PEC or SEC client. The unique RC1 remote control is an exclusive & unique Danish design. The main functions in the Lantic entertainment system can be accessed by the single press of a key. The direct menu structure enables the user to use the Lantic entertainment system immediately, without any pre-knowledge. The RC1 has an easy and single touch control of functions like: video, audio, radio, lights and curtains. The RC1 is standard used for MEC clients and optionally for SEC clients. It can be supplied in its standard silver color version, or optionally gold plated. The RC10 has all the functionality of the RC1 but in a more simple form factor. It is standard used with the PEC. The Lantic RC20 App provides full remote control of the on-board Lantic system.The Lantic RC20 Remote Control Application includes a virtual keyboard for controlling internet and enables full control of a Lantic Client from the iPad/iPhone/iPod. iPods,iPads and iPhones loaded with the App can fulfill the same function as a RC1 or RC10, providing remote access to any Lantic Entertainment System. Utilizing touch screens to display the same menu as can be seen on a zone’s installed monitor, they provide the comfort and convenience of being able to control your Lantic system remotely without having to turn on the main screen. As an extra feature, enjoy the convenience of streaming media from your Lantic system to your iPad and the other way around send media from your iPad to Lantic. The iPod/iPad control solution is standard used for the SEC. Once again a new Play Here button appears on the Now Playing page when the streaming option is available. Press it and the content instantly ceases to play on the Lantic hardware and instead transfers to the tablet or Smartphone. It’s a simple as that! The Lantic System Graphical User Interface (GUI) has a modern visual approach. The GUI is the series of on-screen graphical menus and options with which users interact, via their remote controls or smart devices, to select from the full range of entertainment and other on-board services. The state-of-the-art design is a pleasure to view and is fully customizable while its functionality makes accessing content from both on-board central media servers and local inputs such as iPod docks, Blu-ray players and satellite TV as fast for first-time users as it is for experienced Lantic users. A single touch on the control can also give access to the internet, real-time navigation feeds, full control of local environmental systems and more. Viewing or listening to content stored on an iPad or iPhone on a Lantic system could not be easier. The user just has to ensure that the portable device is connected to the local Wi-Fi network, press the Airplay Stream icon that appears at the bottom of the Play Now screen and then select Lantic Entertainment System as the destination. The Lantic system takes care of everything else. Sound, video or photographs can all be enjoyed on the big screen using the local amplifier and speakers. 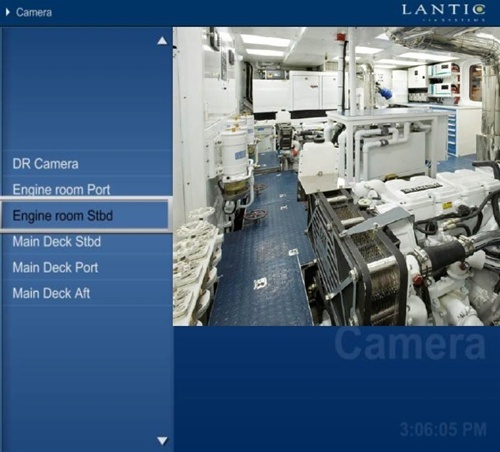 The reverse process, sending TV, movies, CCTV and more from the Lantic System to the iPad / iPhone, represents a major advance in onboard entertainment. Lantic users can now access the full power and versatility of the onboard entertainment system with its thousands of movies and audio tracks from literally anywhere on board that has Wi-Fi access via their Apple devices using PlayHere. They no longer need to use fixed screens and speakers to access music, movies and satellite or terrestrial TV. This gives the possibility to connect 3rd party devices to the entertainment centres via a HDMI switch. The 3rd party devices could be a gaming console or an Apple TV. Only stereo sound from the 3rd party devices is supported. Up to 3 devices can be connected. The devices can be integrated directly in the Lantic menu’s with an icon and a description. In addition to the above HDMI switch control the 3rd party device itself can be controlled via infrared. This gives the possibility to control a local device via infrared. This could be an Apple TV. 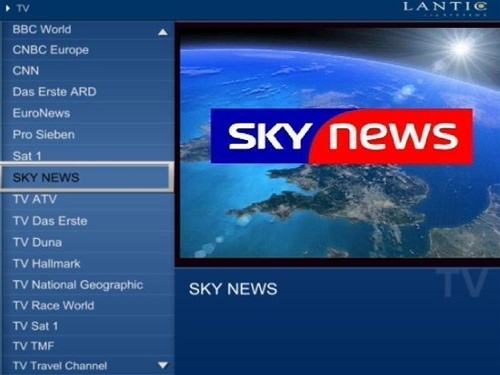 When Apple TV is selected via the Lantic menu it can be controlled from a custom designed menu in the Lantic RC20 app. Alternatively, Apple TV can be integrated via the central Lantic Server. Both the MEC and PEC can be connected to an optional external Blu-ray Drive to play back Blu-ray movies. In addition the Lantic Media Storage Server can contain Blu-ray media to centrally play Blu-ray movies On-Demand. With Lantic Box Control the satellite tuners can easily be controlled with a Smartphone or tablet or from a Lantic Client or Central Aministration Client/Server if this option is fitted. Subscribe to the Lantic Movie Service to enjoy a personalised, up-to-date on board movie library. From the latest blockbusters, favourite comedies, thrillers and dramas to hit TV series, documentaries and music to suite every taste, Lantic offers a comprehensive service that provides owners with unlimited access to regularly updated media libraries on board their yachts. For an annual subscription fee, owners, guests and crew can choose from a wide range of titles including all their favourites. Subtitles and movie data are included in the language of choice. The Lantic Premium Entertainment System combines the latest technology with a modern user-friendly design, creating a powerful and unique Yacht and Entertainment control system, which gives you easy access to a world of entertainment opportunities from maximum 30 Lantic clients. Now let the world come to you! With an elegant and easy to use remote or optionally your iPod/iPad/iPhone, you can control your Blu-Ray movies, music, HDTV, radio and Internet; you can turn up the air-conditioning, draw the curtains/blinds and turn on the lights, when the sun sets in the horizon. Designed with flexibility in mind Lantic Entertainment Systems provides a networked multi-user environment. 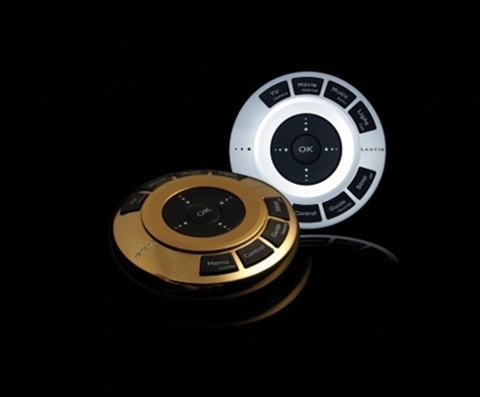 The easy to use, distinctive and unique remote makes selecting all features simple for you, your guests and friends. The wireless keyboard gives you the world wide web at your fingertips, and the optional touch panels provide full control over each designated room. The Lantic Premium System offers the very best in on-board entertainment. From the pedigree of the Pro system its expansion is infinite, offering all the standard features of a Lantic Entertainment System plus the added benefits of CCTV, radar and chart, steward call, weather and internet as standard. Additional options include AC, blind/curtain and light control as well as central playback offering “party mode”. Lantic Premium has been designed specifically for those wanting outstanding Lantic performance, with unlimited expansion and the world renowned remote control, now expanded with the RC20 App for a variety of optional Apple Interfaces including iPad, iPod and iPhone. Full integration options for Apple TV and XBox and other game consoles. With all standard features of the Lantic Entertainment System including Movies and Music on demand. The Lantic Premium Entertainment system is an Ethernet based entertainment solution with Media Storage Server(s), Streamer(s) and Entertainment Centers. Movies and music is centrally stored on one or more Media Servers and is distributed to the Entertainment Centers via a managed Ethernet network. Analogue audio and video signals such as satellite TV decoders and camera signals are captured in a Streamer and distributed via the managed Ethernet network. From the Entertainment Centers all media content is available on demand. - Built-in 2 x 50W amplifier. - Optional 6 x 100W built-in 5.1DS or triple stereo amplifier.